Review: "Lost World: Trajectories" - Sea of Tranquility - The Web Destination for Progressive Music! Several interesting CDs have found their way west from Russia lately, and so far this one takes the prize for being the most musically complete and melodically appealing of them all. 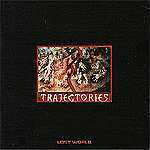 Trajectories is 14 songs of classically inspired art rock which can be appreciated equally by progressive rock fans with simpler tastes and by jaded prog-snobs. One of the interesting sounds is a breathless violin that drives a complex high-paced high-pitched melody. Listen to "Trajectory 1", "Trajectory 2" and "Trajectory 3". Play them back to back and you're treated to a three-part violin and flute concerto with a high-energy pace and moody tones. Look for the recurring themes on this record - for example "Trajectory Z" quotes parts of "Hills Are Breaking Into the Ground", "The Curtain" has elements of "There's Day, Here's Night", and of course themes are liberally traded among the 4 "Trajectory" pieces. "Birds" has an avant garde, minimalist feel to it, with a flute mimicking the sounds of birds cries over a dark, doom-laden repeated bass piano note and deep, dissonant chords. "Splinters" is a short flute piece with Vassily Soloviev layering several pieces resulting in a rapid staccato sequence that would leave Ian Anderson reaching for his inhaler. Another common sound is a flute and guitar playing uncommonly-styled duets. The vocals are in a soft, mid- to higher-register delivery which is fairly pleasing and never dominates - and most songs are mostly instrumental. Listen to the emotional ballad "There's Day, Here's Night" and Alexei Rybakov's wonderfully melodic singing will force you to agree that the days of weak vocals on Russian prog are thankfully behind us. So-so production mars an otherwise excellent listen but it is a well composed, interesting piece with excellent musicianship. Each song is very different from the next, yielding an all round demanding put very pleasant listening experience.